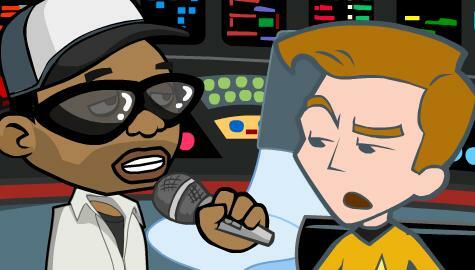 I think the fact that Captain Kirk had a bit of a reputation of being successful with the ladies was what prompted me to use the Star Trek theme on this animated music video for Tone Loc's song, Funky Cold Medina. Although I'm a huge fan of the song when it was released back in 1989 I uploaded it to GoAnimate intending to use it as a backing song to my GoAnimate Complaints Department Plus animation. However it just didn't seem to fit. In December of 2010 I decided it would be a great song to help feature Some of GoAnimate's new Musical Action packs including 'Lead Singer', 'Black Guitar' and 'Drummer' as well as the not so musical action pack, 'Romantic Male'. Those of you with a musical ear should listen out for all the different samples Tone used to create this awesome track. Funky Cold Medina was made at a time when mix artists were ripping samples from all kinds of songs without a care in the world for copying rights. One of the fact sheets I read on the song, notes that you just couldn't make a song like this today without going through a legal minefield of attribution and royalties. This was a difficult music video to make because I tried really hard to synchronize the action with the music and lyrics of the song. The difficulty was compounded by the GoAnimate studio suffering performance issues on longer animations that used Lil' Peepz characters. Thankfully, despite listening to the song more than 100 times during the making of the video, I never got tired of hearing it - and still don't even when I listen to it now. It's just that good a song. I really did my best to make the Tone Loc Lil' Peepz character look like Tone Loc as much as I could. The I.T. Guy features on guitar... now you know what he does when he's not fixing copy machines. The whole idea of the eyeball being related to the evils of Funky Cold Medina evolved as I made the video. You first see it on the Enterprise's view screen where I placed it because I thought it would look cool to have an eyeball planet. As the clip progresses you see the enterprise trying to avoid the danger of the eyeball planet but then you see crowds cheering it and then finally people who've drunk medina have their heads turn into a giant eyeball. I don't know what that means... maybe it has something to do with being singularly focused on one thing? Notice that Tone's Tribble has two of the crazy eyeballs used through out the clip. The live action video section is cut directly from the official video of the song. I decided to use it because; it was an easy way to fill a lengthy instrumental break; it's the only section of the official clip that contains cartoon speech balloons that fit nicely with GoAnimate's cartoon concept and; you don't see too many hand held, guitar like DJ turntables these days so I thought it would be cool to show that instrument from the video. Despite all the problems I had with the studio's performance I was really happy with how this music video finished up. The Lil' Peepz mixed well with the Star Trek Quogs, I got in a few visually interesting ideas and it's fun and funny too. I was surprised when I published this at the number of people who hadn't heard of the song but I was glad I could introduce people to it twenty years later. Oh... and in case you were wondering... at the time the song was released there was no such drink as 'Funky Cold Medina' however, after the songs release, several drinks were given this name taking their inspiration from the song.